The Daintree Rainforest is the perfect escape if you're looking for eco friendly accommodation that won’t break the budget. 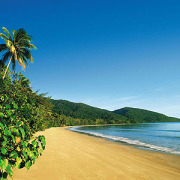 Visiting the Daintree is all about the rainforest experience. Simple, timber cabin style accommodation immersed in the rainforest adds to the overall experience, bringing you that bit closer to nature. Rainforest life in the Daintree is very different to urban living. There is no grid-connected electrical power north of the Daintree River, so households and businesses need to make their own. A high level of rainfall and humidity combined with the means of self sufficient power, and protected ecology, impels that good building design is a must. 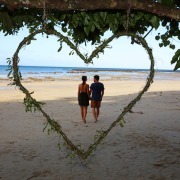 Budget rainforest holiday accommodation is spread out along the Daintree Coast tucked away in pockets of rainforest. Comprising of simple timber cabins and safari tents, rainforest accommodation is designed to have the least impact on the surrounding environment, and to give you that true wilderness experience. Comfortable living in the Daintree relies on making use of natural air flow and light; raised floor construction allows less impact on wildlife, whilst high ceilings and air vents allow heat to rise and escape. Wide verandahs extend the living space to allow for 'open living' all year round, and insect protection ensures local critters are kept out, for a more relaxed stay! Most Daintree holiday accommodation implements a myriad of energy-saving features into their system, to minimise their environmental impact. With the environment in mind, Crocodylus tent huts have been delicately built off the ground and spaced out amongst the dense tropical rainforest. These wooden and canvas bungalows are built safari tent style, with canvas walls and high ceilings to catch the natural breezes. Being immersed in the rainforest Crocodylus guarantees a close and personal rainforest experience, where you can spot wildlife right from your bedroom window or verandah. Crocodylus is perfect for single budget travellers, couples, families and groups of friends with accommodation styles to suit all. Dining is your choice whereby you can purchase homemade meals from the Kingfisher Cafe - open for breakfast & dinner daily, or self cater. The self catering kitchen has everything you need to prepare all your own meals - crockery, cutlery, pots, pans, fridges, gas cooker, BBQ and lots more. 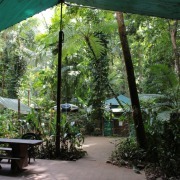 Cape Trib Beach House is the only budget beachfront accommodation in Cape Tribulation, comprising of timber cabins that are scattered throughout rainforest clearings. There are a range of cabin styles suitable for backpackers, couples and families, all featuring the luxury of air conditioning, overhead fans and are fully screened. Among the many facilities at the Cape Tribulation Beach House, you will also find a cafe bar & bistro, self catering kitchen, guest laundry, an internet cafe, pool table, games and activities. 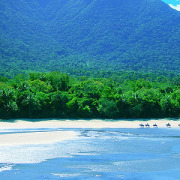 You can wonder through the resort and directly down onto Cape Trib Beach. This rugged deserted beach is good for exploring the fringing reefs. Holiday accommodation and activities are well spread out between the Daintree River and Cape Trib Beach, so hiring a vehicle will allow you the flexibility to explore this magnificent region at your own leisurely pace. 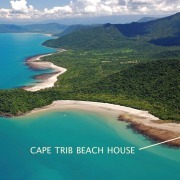 Most conveniences are available at Cape Tribulation. There are two small supermarkets, a bottleshop, cafe, restaurant, ATM, Interpretive Centre and small cinema all within walking distance. If you are choosing to self cater then it is best to stock up on all your provisions in Mossman township.